A dual anti-aging facial treatment. This two pump serum combines the TNS Recover Complex growth factor serum with potent antioxidants and peptides to rejuvenate your skin. 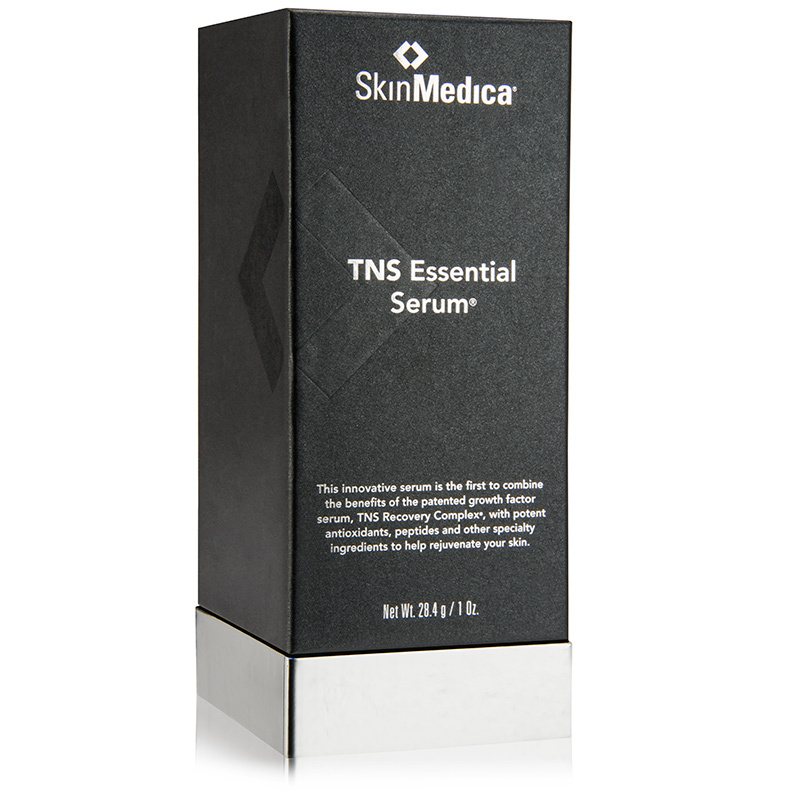 SkinMedica TNS Essential Serum features 2 active formulas that combine to smooth wrinkles and regenerate skin cells for a more youthful appearance. 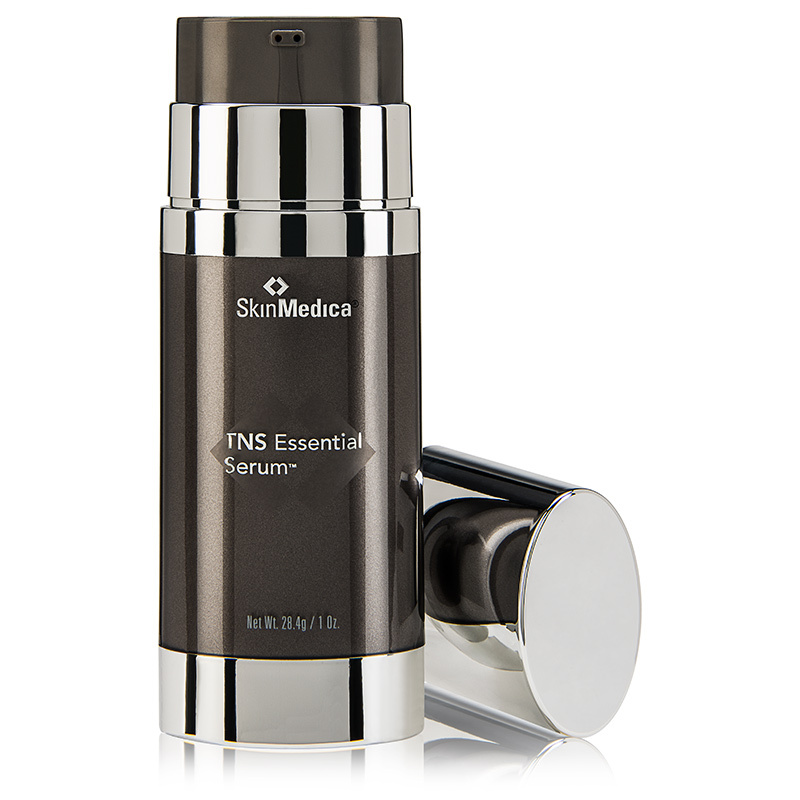 The TNS complex is a protein- and amino acid-rich serum to reduce inflammation and the signs of aging. The APS corrective complex is a mixture of anti-aging ingredients, peptides and antioxidants to strengthen sagging skin. Before the first application lightly tap the top of the pump several times in the palm of your hand. Remove the cap and press on the very center of the pump to dispense both of the products onto the back of your hand. Blend the two products together and apply to the face, neck and decollete. Use morning and night after cleansing and toning. Human Fibroblast Conditioned Media, Water/Aqua/Eau, Cetyl Ethylhexanoate, Olea Europaea (Olive) Fruit Unsaponifiables, Alpha-Arbutin, Isoceteth-20, Arachidyl Alcohol, Glycerin, Ethoxydiglycol, Butyrospermum Parkii (Shea) Butter, Palmitoyl Tripeptide-5, Ergothioneine, Dipalmitoyl Hydroxyproline, Hydrolyzed Sericin, Phospholipids, Ubiquinone, Rubus Fruticosus (Blackberry) Leaf Extract, Saccharomyces Ferment Lysate Filtrate, Tetrahexyldecyl Ascorbate, Aminobutyric Acid, Phytosterols, Tocopherol, Tocotrienols, Squalene, Oryza Sativa (Rice) Bran Wax (Oryza Sativa Cera), Sodium Hyaluronate, Tocopheryl Acetate, Camellia Oleifera Leaf Extract, Dimethicone, Ethylhexyl Palmitate, Silica Dimethyl Silylate, Polyacrylate-13, Polyisobutene, Polysorbate 20, Behenyl Alcohol, Arachidyl Glucoside, Cetearyl Alcohol, Steareth-10, Steareth-20, Butylene Glycol, Maltodextrin, C12-15 Alkyl Benzoate, Xanthan Gum, Acrylates/C10-30 Alkyl Acrylate Crosspolymer, Aminomethyl Propanol, Disodium EDTA, Caprylyl Glycol, Caprylhydroxamic Acid, Ethylhexylglycerin, Phenoxyethanol, Potassium Sorbate, Parfum/Fragrance, Hydroxycitronellal, Linalool, Coumarin, Alpha-Isomethyl Ionone, Geraniol, Isoeugenol.